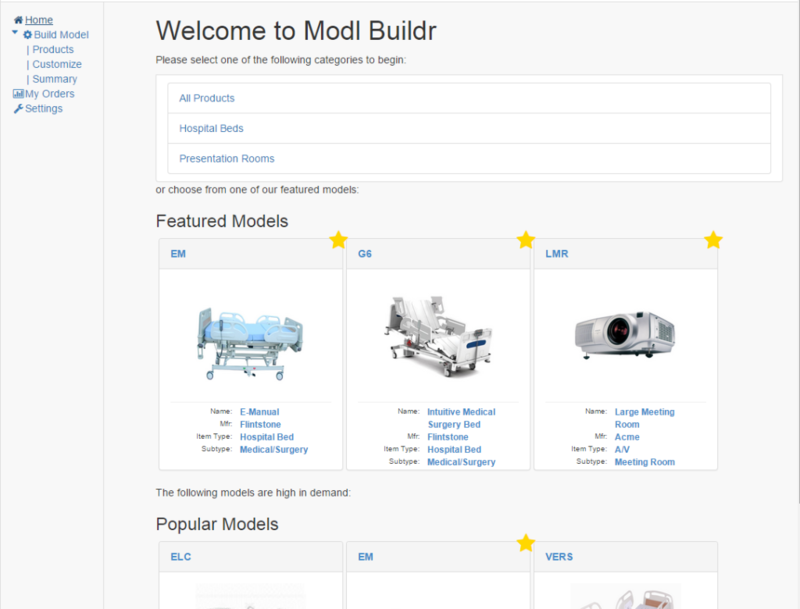 Modl Buildr is a demo application we created at Oasis Digital, a rules-based “configurator”. Its inspiration comes from older desktop application configurators. 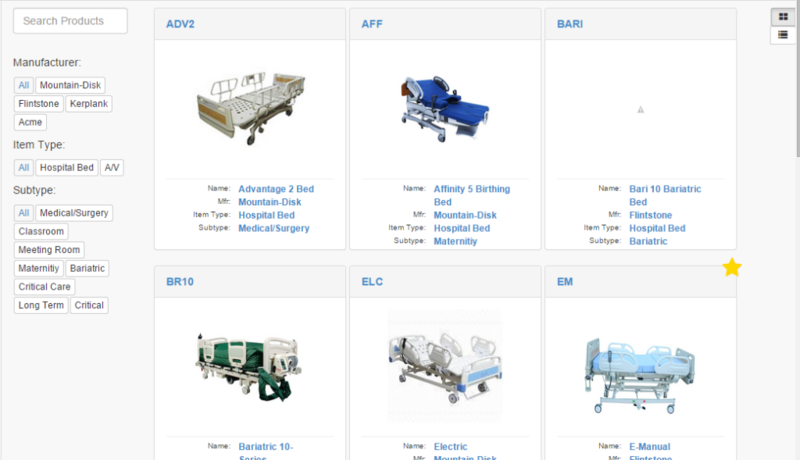 Modl Buildr can be used to generate model numbers for highly customizable products. A user can select a product, choose from a set of options for that product, review the final product and request a quote. This article explains the details of this process and highlights some key features. Should the user choose to browse the product catalog, they see each product presented as a “tile” containing an image of the product and any additional spec information. Adjacent controls provide the ability to filter through the catalog. This is done by typing a product’s name or choosing one of several product categories. This was designed to resemble many other online marketplaces to create a familiar experiences for first time users. As the user interacts with the filters the catalog responds immediately by adding or removing the products that fit the user’s criteria. The results respond to the user’s input without the need for the user to request an update. This type of workflow greatly speeds up the process of identifying the desired product and moves them forward in the process quickly. For users desiring a more compact view of the data there is also a grid view that displays the product information in a dense format. The grid view behaves in the same way as the tile view when interacting with the filtering tool. Once a user clicks on a product they are taken to the configuration page to set the product feature options. The configuration page contains a display of the model number associated with the selected product. 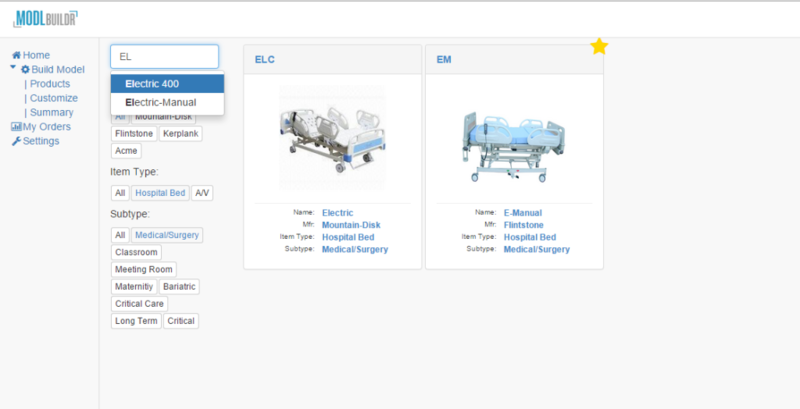 The display updates automatically to reflect the changes from interacting with the product options. 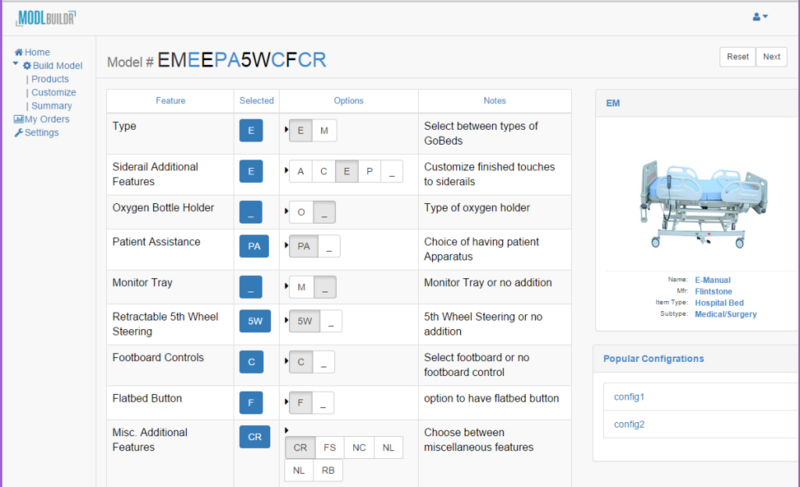 A user configures the model by scrolling through the products feature list and selecting various options. As options are selected additional features will be added and removed automatically. If a user’s selection becomes invalid at any point that option will appear in red with an icon indicating that a conflict has occurred. The corresponding component in the model number will also turn red. The user can click on this portion of the model number and the list of features will automatically scroll to the problematic feature allowing the user to update their selection. Once a valid model number is configured the user can click on the “next” button to navigate to the review screen before requesting a quote. The rules that determine the validity of a product are not “hard-wired” into the application. Instead they are entered by the application administrator and executed on the fly. Examples include, “There are no options for TV controls unless the electric option has been selected” or “Choosing a manually positioned bed invalidates the electric footrest option.” These English phrases can be easily into rules and are associated with a product. These rules are then used by the configuration page to guide the user towards generating a product that meets their needs and the suppliers capabilities. Having selected and configured the product the user arrives at the summary page. The details of the product and the user’s customizations are displayed and they are presented with a simple contact form from which they can request a quote. Once the user submits a quote the application demo reaches its end. But the usage for this platform could be extended in a number of directions. Modl Buildr could be extended to include an additional step for browsing and manipulating the components that go into manufacturing the final products at another level of detail. The application could be expanded to include sales information and trends. Additional features common to other marketplace applications could be added such as shopping carts, order history, billing information, etc… On the administrative side of the software additional screens could be added for the management of products, orders and other common administrative tasks. Modl Buildr is a small example of the kind of business-centric software that we create every day. If you are interested in how it works we would love to show you more.